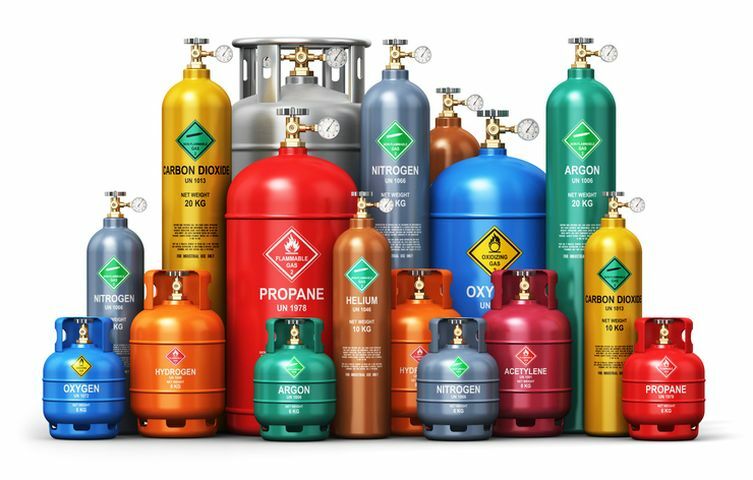 Compressed gas is a generic term used for describing compressed gases, liquefied compressed gases, refrigerated liquefied gases (cryogenic gases) and dissolved gases. Compressed gases may also be referred to as gas cylinders. Gases are classified in different ways according to definitions by different regulations including Department of Transportation (DOT) and Fire Code regulations as well as by classification systems such as the Globally Harmonized System of Classification and Labelling of Chemicals (GHS). These classifications are different and overlap in some ways. Users should be aware of all the hazards associated with the gases they are using. The links below are to the Fire Code definitions for compressed gases Web page and GHS and DOT definitions with pictograms to help identify how chemicals are classified. Cylinder manufacturers include engraved markings on cylinders to allow proper identification of substances in the container. Do not attempt to identify the compressed gas in the cylinder on your own. Be sure to contact the manufacturer if you are unsure of cylinder contents. Leave the area immediately and get to a source of fresh air. Complete a report in the Online Accident Reporting System. The fire code requires rooms or cabinets containing compressed gases to be conspicuously labeled “COMPRESSED GAS.” The caution sign generated though the MyChem system can be used to meet these requirements. Cylinders stored and used on campus must be clearly labeled. 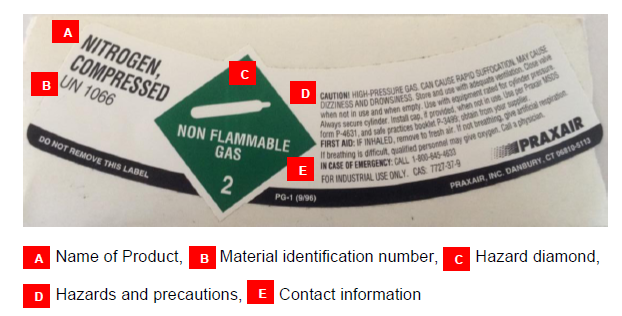 According to United States Department of Transportation (DOT) and Occupational Safety and Health Administration (OSHA) regulations, the labeling must list contents, concentrations, hazard classifications, safety precautions and the manufacturer or supplier. Do not remove manufacturer applied labels. Be sure to contact the manufacturer if you are unsure of a cylinder's contents. All cylinders should bear a cylinder status tag stating one of the three conditions: full, in-service or empty. Piping and tubing containing gases must be carefully designed. Refer to the Gas and Cryogen Focus Sheet for key design concepts. Pressure regulators lower the gas pressure to a useable level. There are two kinds of pressure regulator designs, which appear similar: single-stage and two-stage. Single-stage regulators are used when precise control of delivery pressure is not required. Two-stage regulators give precise control. Keep regulators clean and free of surface oil and grease, especially oxidizing gases. Always use the proper regulator for the gas in the cylinder. Connection fittings, stamped Compressed Gas Association (CGA) numbers, plaques and/or decals on the regulator indicate for which gas the regulator is designed. Do not use Teflon® tape, putty or other such materials on the threads unless specifically required (or applied) by the manufacturer or vendor. Praxair, Inc. was selected for a University contract to provide compressed and liquid (cryogenic) gases after an open competitive solicitation process, and in consultation with several University departments. Special Fire Department permits and engineering controls such as a gas storage cabinet may be required to use toxic or corrosive gases. Prior to ordering these gases, you are encouraged to contact EH&S at 206.543.7262 for an assessment and to ensure proper safeguards are met. Extra precautions must also be documented in your standard operating procedures (SOPs) for these chemicals. ALL toxic and highly toxic gases are purchased through Praxair, unless unavailable. Ordering information is provided on the UW eProcurement Web page. Cylinders and Dewars are particularly vulnerable to damage during transport. Refer to the Transporting Compressed Gases and Cryogens Focus Sheet for best practices for transporting these materials safely. Do you own the cylinder or rent it? For example, when you procure a gas cylinder from Praxair, you buy the gas but rent the cylinder (pay demurrage). When you are done with the cylinder, you contact the company listed on the cylinder and they will pick it up. If you own the cylinder, skip to the next question. If the cylinder is empty, depending upon original contents, the valve can be removed and the cylinder disposed of as scrap metal. To recycle empty, vented, and de-valved cylinders as scrap metal, remove or deface all labels, write “empty” on it, and contact UW Recycling to arrange a pickup. If the cylinder is not empty, but only contains common atmospheric gases such as nitrogen, it may be safely vented and emptied, de-valved and disposed of as scrap metal. Contact the Environmental Programs office at 206.616.5835 for guidance on removing the valve on your particular cylinder. If you are not able or willing to de-valve your cylinder, we can do it for you. There is a charge of $50 dollars for each cylinder. Please provide a budget number with your request. All other non-rented, non-empty cylinders can be disposed of by submitting an online chemical collection request form. A liquid having a vapor pressure exceeding 40 psi at 100° F (38° C); as determined by ASTM D-323-72. Examples include: helium, nitrogen, oxygen, and argon. The class of gases that are referred to as liquefied compressed gases become liquid at normal temperatures when they are pressurized inside a gas cylinder. Examples of liquefied gases include: ammonia, chlorine, methane, natural gas and liquefied petroleum gas or liquid petroleum gas (lpg) which are propane and butane. Kept at very low temperatures. Extremely cold with boiling points below minus 150° C.
Heavier than air under cold temperature conditions and can accumulate near the floor. Able to expand into very large volumes of gas from small amounts of refrigerated liquefied gas liquid. Examples of refrigerated liquefied gases (cryogens) include: helium, liquid nitrogen, and liquid argon. Carbon dioxide and nitrous oxide, which have slightly higher boiling points, are also included in this category. Bulk storage and container transport of cryogenic gases is in liquid, double-walled, vacuum-sealed containers that can be either pressurized or non-pressurized. Pressurized containers have vents, dispensing hoses, and pressure gauges. Pressure relief valves are spring loaded devices set at a specific pressure that relieve excessive pressure, reclose and reseal to prevent further release of product. Non-pressurized containers are typically open-topped vessels or Dewars with loose fitting covers to minimize evaporation or off gassing and range from one to 50 liters in size. This class of gases that are referred to as dissolved gases are those that are dissolved in another substance. Acetylene is the only commonly used dissolved gas and it is dissolved in acetone. It is chemically unstable and flammable. WAC: Permissible Exposure Limits for Airborne Contaminants.